Arthurian legend tells the romance, misfortune, and daring of the knight Lancelot, who fell in love with the wife of his king. The Lancelot Sword with Sheath is a stainless steel replica weapon based on this infamous medieval warrior. The brass tone pommel is decorated with Lancelots coat of arms, a complex emblem with a red stripe across its center. Wrapped in wire, the antique brass tone grip is thus textured, creating a firm hold for the wielder. The crossguard of this decorative sword stands out, with the three dimensional heads of beasts decorating the ends of the slightly angled guard arms. A bold red fleur adorns the center of this antique brass guard. 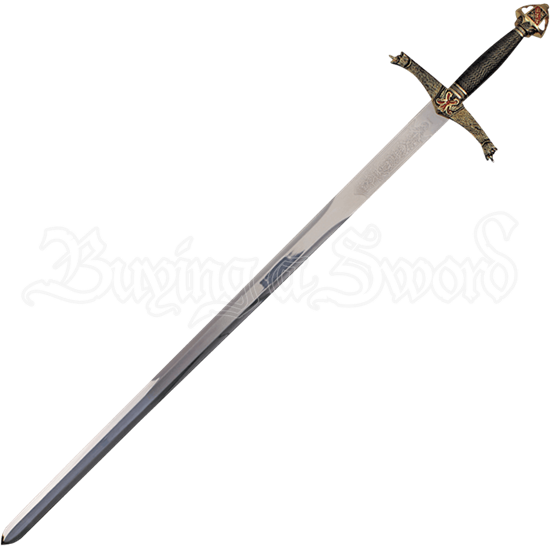 Subtle etching details the ricasso of the blade, adding a final touch of beauty to this intricate, collectible sword. The included black sheath features matching brass tone detail at its opening and endcap, making it easy to stylishly store or display the decorative weapon. A unique addition to sword collections and a must-have for fans of Arthurian legend, the Lancelot Sword and Sheath presents a stunning display of medieval myth and weapon style.